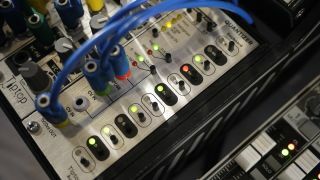 Tiptop Audio had a new prototype module in the form of the Quantizer playing at its Superbooth16 stand. Not satisfied with the current selection of quantisers available, the Hollywood modular manufacturer decided to take matters into its own hands. The result is super fast, accurate and changes scales at the flick of a switch. The module on display at the show was just a prototype and more features will be added before its launch, one of which will be a large fader to blend between scales. First up is the new snare drum module, the SD909. Zero guesses as to which snare it's modelled on. Second is a new DSP card in the form of the Dragonfly II for the immensely popular Z-DSP module. Both this and the SD909 are available now, with final details on price to be announced shortly. And finally, there's the release of a second compilation called Various Artists 002 on its label, Tiptop Audio Records. Featuring many artists including Scanner, Joao Ceser and Florian Meindl to name but a few, you can check out a preview on the label's SoundCloud page.